Great Adriano! Gingko is my favorite text editor even aesthetically. I would like to try it, though feedback would be very little. I would like to give it a try, as well. I would be delighted to run the app through some paces. This comes at a fortuitous time as I will be starting up a blog within the month. The site will have many subject matters and I was looking for ways to maybe organize the information to be posted to the site (before actually publishing to the site). Of interest here is the markdown export capability for site content – and of course the organizational capability of Ginko. Can i sign up for the beta please? I am ready to try, since long. I’ve received a huge response from people willing to test this out. All are being added to my list, but I’ll be contacting you a few at a time. I will need you to contact me by email, though. So if you’ve only posted a comment, but haven’t sent me an email, please do so. Looking forward to getting this out to you. Yes, I would like to assist in the beta. Specifically, at least at first, I would use it to organize the future content of a new blog I am starting – the blog has several “categories” and I have many ideas for posts in each. Using Gingko might be a good test as I wrap my head around the content as it will need to track references, inspiration, and original content somewhat akin to writing a paper, just in the small. I can try it on my Macbook. Will drop you an email. This is very exciting! I’ve sent my request to be a tester. I’m curious about one thing – will the desktop app be able to work in tandem with the web app? I use that version on my iPad. 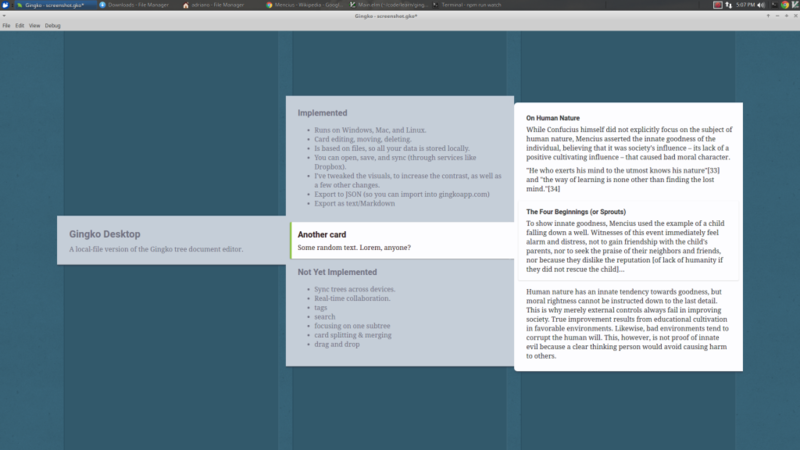 For now, the only way to sync from Web to Desktop is to manually export from one, and import into the other. I use Gingko Web. Was looking forward to this because local saves will allow me to work offline and keep all planned article structures in-hand before I enter a no-web zone. Really interested in the Public Beta test. I am on Windows. This is awesome! Nice to see it coming to windows. Still have my fingers crossed for a chrome or android app release so I can use it on my chromebook offline! You can use it offline with the Chrome app right now. If you do, though, I wouldn’t recommend very long periods of being offline with it. It is really working well. Is it going to get developed further? In my opinion it would be worth doing. Yes, I’m working on it! Just noticed that the offline version of the Ginkoapp sets no limit on monthly cards. So…although it’s more of a good thing for lazy people like me, don’t you really want to fix this? If you need further help translating this software into Chinese, I would love to give you a hand! Anyway, do contact me if you need my help. Have you tested the web-based version on a Chrome machine? Congratulations, you’ve created an amazing piece of software. I’m moving a story I’m working on into Ginko for a proper test run! I´d REALLY like to buy Ginko Tree for Desktop, because I need to keep my data local, as my customers rules require safe data storage – NO cloud services allowed. Can you give a rough estimate when it might be ready? This is really the tool I have been looking for since EVER 😉 It´s really great! Looking forward for the desktop version and I am NOW becoming a subscriber!